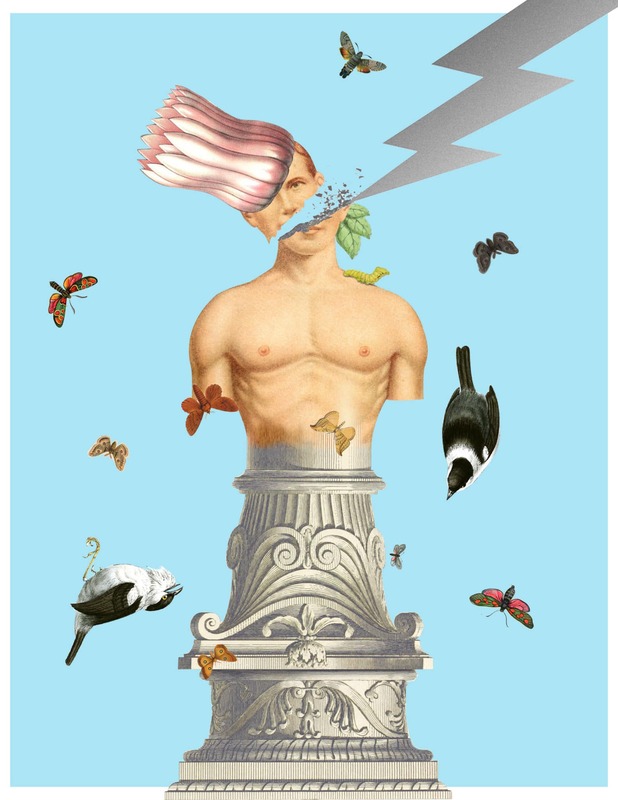 The 16th card in the Major Arcana, the Tower (XVI) is all about change. It’s generally considered to be a dark, threatening card and can often be a forebearer of unforeseen and deeply traumatic events. In a reading, it can indicate that disruption and conflict are coming your way. Attempting to preserve the status quo is futile — the wisest approach is to accept change as a natural part of existence and roll with it as gracefully as you can. The Tower card depicts a tall church tower, nestled on top of a mountain, that’s been struck by lightening and set ablaze. Flames shoot out from the same windows the people trapped inside are desperately jumping from, vainly hoping to escape the turmoil and destruction within for the danger — and certain injury — that lies below. The Tower illustrated in the Rider-Waite deck is square with a crown that’s been knocked off by the lightening strike. A circular crown will never fit properly on a square. As such, the tower represents an ambitious project that was nevertheless constructed on an irrationally conceived plan. It needs to be destroyed so it can be built anew on more solid footing. There are 22 separate flames in the illustration, which represent the 22 Major Arcana cards, all falling to the ground alongside the humans who have leaped from the inferno. The grey clouds symbolize a universal secret that is in danger of being exposed, whereas the lightening bolts symbolize truth. The lightening moves from left to right, a symbol of the subconscious mind merging with the conscious mind, together denoting a sudden, and unexpected, spiritual awakening. As a person the Tower denotes an iconoclast who is forever eager to disturb the status quo. This is an individual prone to emotional outbursts and unnecessary drama who enjoys rocking the boat at every opportunity. Put bluntly, Tower people are disturbers of the highest order. They tend to be tactless, rude, and quick to reveal secrets entrusted to them, particularly should they hold hidden truths that could be explosive and damaging to the situation, body or organization at hand. The truths offered by Tower people are often genuinely enlightening. However, they are not always welcome as they tend to be painful in their brutal honesty, and as such, are secrets a Tower person is only too happy to reveal. While the Tower typically represents disaster, emotional strife, and sudden change so intense it disrupts the foundation of the person or organization in question to their core, it also serves as warning that there can be no more hiding from the unpleasant realities of life you’d prefer not to face. You will eventually find that this change or series of changes turns out to be positive. Once you get over the shock of it, you will emerge from the experience much less naive and far better equipped to deal with the world. The unpleasant truths you’ll soon face should serve as a catalyst for your emotional and spiritual awakening, which will prove to be crucially important to your well-being moving forward. The Tower in a love reading is rarely a positive sign, rather it signifies an unhealthy relationship primarily marked by conflict. It usually portends something unexpected and disastrous is about to happen, such as discovering your lover is having an affair with one of your closest friends or siblings. Similarly, if you’ve been cheating on your partner, you’re about to get caught and forced to face the consequences of your infidelity. If you’re single, the Tower could infer that you’re feeling especially empty and lonely as a result of your relationship status and still suffering abandonment issues carried over from your last serious relationship. Career-wise, the Tower denotes working in a negative or hostile environment, or employment that is potentially dangerous, such as firefighter, underwater welder, or soldier. It often indicates a lack of job security or actual job loss. At the same time, it indicates that a stressful, highly emotional change is about to take place. This could involve being promoted to a position you’re scarcely able to navigate at first but which promises to bring great reward once you’re over the learning curve. You need to be especially careful and prudent with your spending. At it’s most negative, the Tower portends failure and bankruptcy, perhaps the result of repeated bad investments. If you still have the resources, now is a good time to start putting some money aside. Prepare for the worst, as the financial catastrophe that awaits will be entirely out of your control. Perhaps the markets will crash, or you’ll get audited by the IRS and discover you owe them far more money than you have at your disposal. You are feeling especially vulnerable to disease, and as such you need to do everything in your power to live as healthily as possible. Even if you don’t necessarily feel compromised or ill at the moment, you would be well advised to schedule a full medical examination, including blood work and any X-Rays your doctor requires. When the Tower reversed appears in a spread it means a crisis looms in your immediate future, and that you won’t be able to avoid its manifestation regardless of how much effort you expend trying. This change might be painful, but ultimately it will be beneficial in that you will emerge from it all as a wiser, more self-reliant individual. At the same time, when reversed the Tower may indicate that all of the above will still take place, but you’ll be blessed with a bit of breathing room before everything hits the fan. In a love reading, the Tower reversed suggests that for all intents and purposes your current relationship is over, except you continue to delay the inevitable for fear of the pain you expect it will bring. You need to face reality head on and end the relationship, because even if you keep holding out in the hope things will eventually change for the better, deep down you know they won’t. By ignoring the truth you’re doing yourself a great disservice. So long as you continue the charade, you’ll be missing opportunities to find your true soulmate. 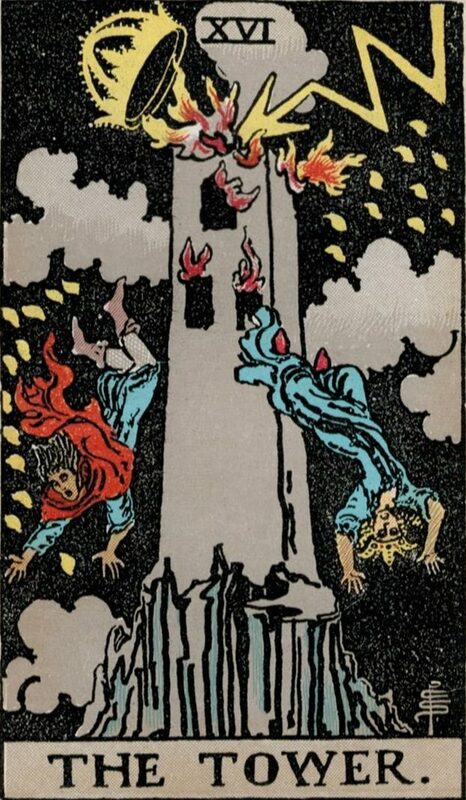 The Tower reversed is an indication that your job is in peril but you’re handling everything surprisingly well under very difficult circumstances. Your job is stressful at the best of times and even more challenging now that events have taken a turn for the worse. However, should you fail (and remember, the Tower is the tarot card most representative of failure) and ultimately lose your job, remember that being out of one’s comfort zone often serves as inspiration to pursue avenues you likely wouldn’t follow otherwise. While stressful, these roads sometimes have a way of leading to great things. Finding the Tower reversed in your spread suggests that you’re trying to escape inevitable financial ruin. As dire as this no doubts sounds, it may not be quite as terrible as you think. Perhaps it will motivate you to start up a new project, one that you wouldn’t have realized were it not for your troubled finances. Filing for personal bankruptcy could enable you to leave your financial obligations behind and start thinking clearly again, minus all the stress your debts have been bringing you. For instance, maybe you really should consider defaulting on your mortgage — surrender the keys to your home and start renting again. These are definitely tough choices, but in the end being pro-active about your financial situation will leave you a happier person. You may be ignoring the warning signs of a serious illness by irrationally believing these symptoms will go away on their own. You obviously need to abandon these thought patterns and schedule an appointment with a medical professional for a thorough check up. You may find yourself greatly relieved to learn there’s nothing wrong with you and the symptoms you’ve been ignoring are nothing to be concerned about. No matter the outcome, you’re not doing yourself any favors by not facing your health situation head on. In the past position, the Tower indicates that you have experienced a traumatic event which continues to negatively affect you. It could be in the recent or distant past — either way, you must learn to move forward and leave it behind you, where it belongs. In the present position, it represents a longstanding conflict that’s about to come to its conclusion. It could be of a romantic nature, and if so, you need to step back and reevaluate the relationship in order to proceed in the right direction. As a future reading, the Tower indicates that the worst is behind you, but you still have a series of major challenges coming your way. So long as you take on and survive these challenges gracefully, your immediate future promises to be bright. The Tower clearly isn’t the greatest card you could ever hope to find in a spread. That said, however, it isn’t necessarily categorically negative either, as profound change — such as moving to a different country, for example — can sometimes work out to be a positive in your life. This combo appears to let you know that despite a bout of turbulence in your life, you will rise to the occasion and weather the storm with a tremendous show of personal strength. The Star tarot card represents hope and optimism. See the appearance of these two cards as a positive indication that where there has been any destruction in your life, the time to pick up the pieces and resume control of your destiny is upon you. Be aware of the actions of others in your life as the pairing of these two cards signals that a negative force is at play. Keep yourself protected.